It's that time of year again in Pittsburgh—whether you're in the city or the suburbs, no road in the area is safe from potholes. Due to Western Pennsylvania's unique climate and topography, roadways become a breeding ground for potholes in the late winter and spring. These road craters can cause damage to vehicles, and car accidents. And it's not just drivers who should beware—potholes are a safety hazard to bicyclists and pedestrians as well. What should you do if you see a particularly problematic pothole in your area? And what can you do if a pothole damaged your vehicle or caused a car accident? 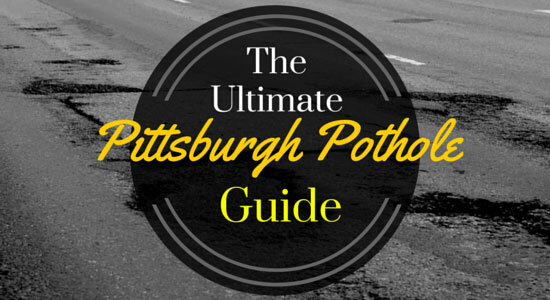 We've put together the ultimate guide for how to deal with Pittsburgh's Pothole Problem. Each year, the citizens of Pittsburgh call in to report approximately 4,000 to 5,000 potholes. With Mayor Peduto's help making road repair a priority, the typical pothole in Pittsburgh will now be repaired three to five days after being reported. Public Works and PennDOT maintain that even within this timeframe, they still aim to patch the more dangerous potholes first. How you report potholes makes a difference. Report as much detail about the pothole's location as you can. Specific street names are much more helpful than "near where the old CVS used to be." Include what Public Works officials call "Red Flag Information." "Red Flag Information" is how the pothole is specifically impacting safety and traffic flow. The more Red Flags a pothole raises, the faster it will be fixed. For example, did you witness vehicles dangerously swerving to avoid the crater? Don't wait. If you notice potholes or other dangerous road conditions, report them immediately. There are different groups to contact depending on who owns the road on which you spotted the pothole. Call 3-1-1—this is the City of Pittsburgh's Non-Emergency Response Center. All calls to 311 are answered by a live operator from 7:00 a.m. to 4:30 p.m., Monday through Friday. Can't make a call right away? At any time, you may leave a voice or text message for the 311 Response Center by dialing or texting 412-573-9736. Be sure to have the following information available: 1) Name of County, 2) Name of Township/Borough, 3) Name of road, 4) closest intersection. Your name and phone number is optional. Say you've been injured in a car accident caused by a pothole, or maybe your car was damaged because of one. Who's responsible? Beware—Pennsylvania has very specific laws about your rights as a victim of an accident caused by bad roads. Did Bad Roads Cause Your Accident? If you've been hurt in a car accident because of any dangerous road condition, don't assume that it was your fault. You may have a case. We'll stand up against the government—or whoever is at fault—and get you the money you deserve. Our car accident attorneys have experience proving cases where potholes, ice patches, or any bad road condition had an impact. Contact Edgar Snyder & Associates right away at 1-866-943-3427 or submit your information online.